This section of the Billy Goat Trail is by far the most demanding—but extremely rewarding for those who complete it. You’ll scramble and climb over angled rocks and boulders while taking in views of the frothy Potomac as it squeezes through Mather Gorge. The 1.7 mile trail turns into a 3.7 mile loop when you return by the more leisurely C&O Canal towpath. Because of its rugged terrain and rock scrambling, this section of the trail carries additional cautions with it. Hikers should allow extra time—2 to 3 hours for the cliff trail, and longer for the return loop. If you are not in good hiking condition, have small children, or dogs, you should consider other trails. Section “A” starts below Great Falls near the Stop Gate and ends on the towpath just upstream from the Park’s Angler’s access point. As with all Billy Goat Trail sections, hikers should wear sturdy hiking shoes, be prepared for weather changes, carry and drink plenty of fluids (never drink from the Canal or river), never hike alone, and stay off slippery rocks and cliff faces. 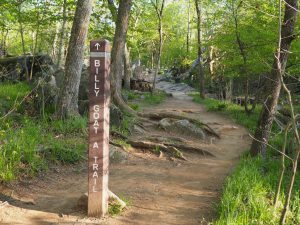 See Billy Goat Trail A: West Trailhead and Billy Goat Trail A: East Trailhead for where to begin your hike.